The theme of this poem — or, at least, its general sentiment — is the transitory nature of most human endeavour. You may think yourself a big man or woman in your time, but what are the chances that your memory will live on beyond the next generation? Initially, I wanted to contest this poem. Ozymandias is no longer a nobody, no longer a cypher in the sand. 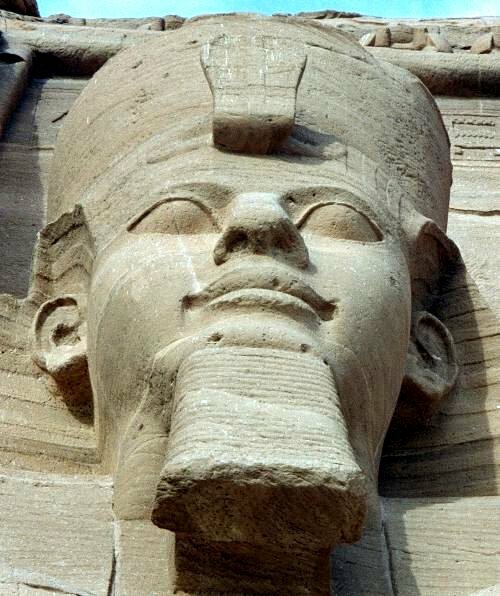 He is Rameses II, one of the most powerful New Kingdom Pharaohs. His temples and his tomb are known. We know the stories of his reign. He is likely the Pharaoh of the biblical Exodus. Thanks to archaeology and historical linguistics, we can read the stories of Rameses and other powerful men lost in antiquity, whether through text or artefact. Ozymandias has been rediscovered! Rameses shall live eternal in the memory of humanity! As I was plotting out this post, however, another memory from Sunday came flooding in. On Sunday morning at church, a friend asked how my week had been. I mentioned the Charlemagne commemorative lecture. He said he did not know who Charlemagne was. Charlemagne is a much bigger figure in the cultural memory of Europe than Ozymandias/Rameses II. He is much more recent. He is European. He did all sorts of stuff. Some European schoolchildren learn about him in their history classes. I have no doubt that he is an important part of First Millennium Studies. But this doesn’t necessarily mean that Edinburgh accountants know who the man is. And so we come full circle back to Shelley’s poem — the memories of the great are feeble and weak things, even when they have the infrastructure of Europe to help keep them alive. This entry was posted in Ancient World, History, Literature, Mediaeval, Other Poetry and tagged ancient egypt, charlemagne, history, ozymandias, percy bysshe shelley, rameses ii, ramses the great, who is ozymandias on February 4, 2014 by MJH. 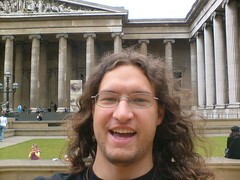 So, in my travels for research I’ve been to a number of museums (not for research; for personal edification and fun). In Germany I’ve visited three museums in Munich (one of Egyptian art, two of Classical), one in Leipzig (Mendelssohn’s house), two in Wolfenbüttel (Schloss & Bibliothek). In Firenze alone I visited the Archaeological Museum, the Palazzo Pitti, the Accademmia, San Marco, and the Uffizi (one museum fewer than in three German cities!). In Milan I visited the museum in the Castello Sforzesco and the archaeological museum, plus the exhibit in the treasury of Sant’Ambrogio. In Paris I visited the Louvre, the Musée nationale du Moyen Age (aka Cluny), and an exhibit/archaeological site beneath the parvis in front of Notre Dame. In Oxford I visited the Ashmolean and the Pitt Rivers Museums. I don’t think I’ve been anywhere else on a research trip. Yet. Anyway, I like going to museums. There are lots of reasons. Here are a few: old stuff rocks, museums connect us to the world, local museums connect us to where we are. Old stuff rocks. (Do old rocks stuff?) This is the primary reason. In Munich (and here’s the actual inspiration for the post) I came face to face with this tiny, little carving. It was about an inch and a half wide, and an inch tall. It had a few wee figures carved onto it. Apparently it was the top off a sceptre. From 3000 BC. That’s right. 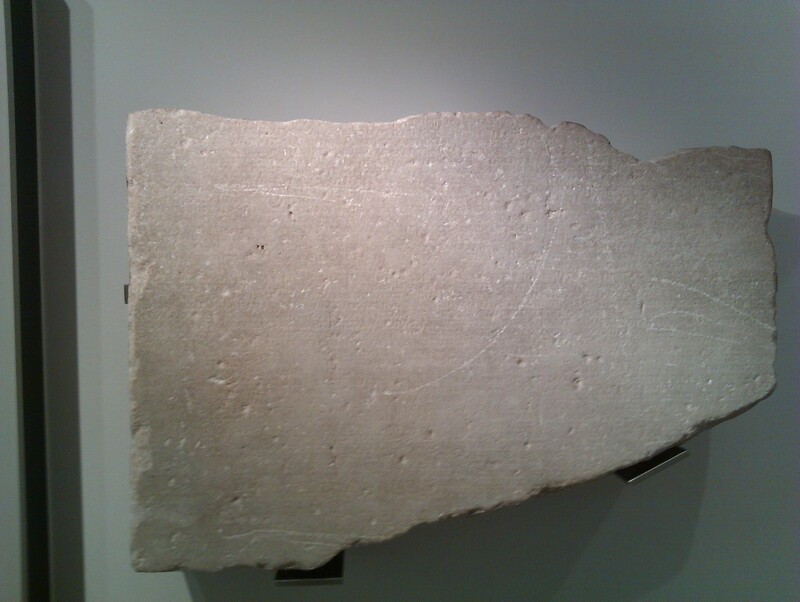 5000-year-old art. Right in front of my face. Mind-blowing! Mind-boggling! Exquisite. Beautiful. Fantastic. So much old stuff everywhere. I love observing the beauty of old, ancient objects. Real people, long dead and turned back into the dust whence they came, fashioned these objects. And through the many vicissitudes of time and history, these bits of human creativity have survived. And I, and anyone else who happens to visit these museums, get to see them. What an immense privilege! A direct connection with our ancestors, with the people who forged our civilizations, who made decisions that may affect us now, today, for good or for ill.
As you know from my post about the Louvre (still having troubles linking to content on this blog, sorry), I love visiting Roman Emperors and Empresses and guessing who they are. That’s how precise Roman portraiture is. I feel like I’m looking a pasty-white Augustus in the eye, you know? Museums connect us to the world. Museums connect us to history; this is what the above stresses besides how much old rocks stuff (wait a minute …). In the Canadian War Museum in Ottawa, you can see the tunic worn by Sir Isaac Brock, saviour of British North America, the day he died in the War of 1812. There is a clearly visible hole where he was shot. But in the Glenbow Museum in Calgary, I as a boy got to see arms and armour from far-away, fairytale Europe as well as local artefacts of note. In a world before jet-setting the way people do now, this was a very important function of the museum. In Toronto, I could go to the Royal Ontario Museum and look at their very fine Egyptian collection, including mummies and a Book of the Dead and all the usual things. I couldn’t afford to go to Egypt (still can’t, frankly). But the museum brought Egypt to me. The special exhibits hosted by the Canadian Museum of Civilization (in Gatineau, Quebec, across the river from Ottawa) brought to me as an undergrad Vikings and Danish Bog People and the Dead Sea Scrolls and Petra and Pompey. Fantastic. Museums have also brought me into contact with cultures that are less well-represented on this blog. At the Glenbow when I last visited, they had a special display about Buddhist and Hindu art. Very interesting and very fascinating. I can even less afford to visit India, Korea, or Thailand than Egypt, but the museum brought their art to me, and I learned about their cultures. Local museums connect you to where you are. This final point was one stressed at Milan’s Archaeological Museum. Why care about local archaeology and artefacts? Because that is what makes your city, your people unique. World history has shaped us; local history has shaped us. In an age when all cities are homogenising with similar architecture and the same shops (Tesco in Shanghai, Pizza Hut in Cairo, Second Cup in Nicosia), it is the archaeological and material culture of your city’s own history that help make it unique, different. These objects connect us to these places, they help us see what has made them what they are, what they were. So in Milan I saw some very fine Late Roman artefacts, through to the material remains of the Langobards (Lombards) and mediaeval frescoes in a Late Roman guard tower turned chapel. There was Milan, itself, unique, before me in the archaeology and artefacts of its history and the history of Lombardy. This entry was posted in Ancient World, Art, Classics, History, Mediaeval, My Travels and tagged ancient egypt, calgary, canadian museum of civilization, canadian war museum, glenbow museum, milan, munich, museums, ottawa, royal ontario museum, toronto, why museums matter on May 18, 2013 by MJH. Last night I watched the second and final episode of Ancient Egypt: Life and Death in the Valley of the Kings hosted by Dr Joann Fletcher. You can read my review of episode one here. In this episode, we learned about the preparations that Kha and Meryt took towards burial as well as the story of the modern archaeologists who found their tomb intact in 1906. And this is what ancient Egypt is most famous for. After being mummified not by being dried out entirely as we usually learn of it but, rather, being basically pickled with all their organs intact, Kha and Meryt were buried in their tomb near their home village of Deir El-Medina. Meryt died first and was buried in a sarcophagus that looks to have been built originally for Kha. First, however, rites were performed at their funerary chapel. The gilt sarcophagus would have been set on its bottom and then a seventy-step ceremony would have been conducted to revivify the senses of the ka of Kha — that is, his spirit. There would also have been professional mourners — of course. Most ancient Egyptians would locate their tomb directly beneath their funerary chapel. However, after 2000 years of tomb raiding, people like Kha got smart. He built his lovely funerary chapel at the edge of Deir El-Medina, but located his tomb nearby down through a steep-sided hole in the cliff face beside the village. Thus no one found it until 1906. The tomb was sealed up and hidden by rubble. Once Kha and Meryt were within, the remaining rites would be performed at the funerary chapel. In the tomb they had most of their earthly goods, including make-up and perfume, jewellery, food, and other things necessary for the afterlife — including little, carved slaves called shabti. Entombed with them was one of the longest, intact Books of the Dead we have. The Egyptian Book of the Dead, contrary to what viewers of The Mummy in 1999 may think, is not a big, black book bound along one edge full of magical spells that can raise the dead. It is a long, papyrus scroll full of magical spells to assist the deceased in his passage to paradise and the green-faced god Osiris. One of the concerns that we see played out both in the Book of the Dead as well as some tomb walls and in every papyrus shoppe in Cairo is the judgement of the heart (that is, soul) of the deceased, weighed on scales by Anubis and a god who escapes my memory. If the life of the deceased was not true, was not holy enough, the heart is thrown to a beast that devours it. Thus, one of the objects included in a mummy’s wrappings is a heart scarab, that weighs down the heart to prevent it from speaking ill of the deceased at the judgement. You can see the appeal of this scene of judgement to a modern Egyptian Muslim. Immortality is something that people long for. Thus, we have Pliny discussing the idea of immortality through art, as I’ve blogged before. Or Cicero’s scheme to erect a shrine in honour of his dead daughter, hoping to deify her. Or that episode of Star Trek: Deep Space Nine where an entrepreneur determines that death happens because our cells get bored, so he develops a device that can keep them from boredom. A friend of mine once read a book arguing that all religion stems from our fear of death and desire for immortality. I disagree — I think it comes from a reading of all religion through the modernist distortion of Christianity as simply a ‘Get into Heaven (or out of Hell) free card’. But, certainly, the fear of death and the desire for immortality — or, perhaps, a sense that the soul of the deceased does not simply cease to exist at bodily death — are aspects of many religions and philosophies. Egyptian pyramids and funerary temples or chapels are certainly religious testimonies, along with the Book of the Dead. The last phrase of the Apostles’ Creed is a belief in the life of the world to come. Hindus believe in immortality through reincarnation. Romans believed that people could possibly become gods and that ancestral spirits were present in their homes — and they had rites as a result of these beliefs..
Today, people scoff at such beliefs. But neuroscience will never fully explain everything about the human soul. We may be psychosomatic unities, but that does not mean that when the soma, the body, dies, the psyche, the soul or mind, dies with it. This entry was posted in Ancient World, Christianity, Classics, History, Mythology and tagged ancient egypt, deir el-medina, egyptian religion, immortality, joann fletcher, life and death in the valley of the kings on April 2, 2013 by MJH.